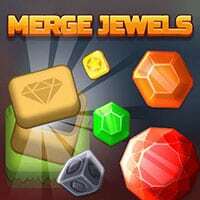 Become a true jewel collector in Merge Jewels, this addictive puzzle and idle game! Merge boring rocks and turn them into shiny gems which earn you coins in return. Discover amazing jewels the further you progress and extend your collection. The gameplay is simple: tap repeatedly or wait to get a jewel box, open it and start merging! Earn experience, level up and enlarge your board to collect even more gems. Watch out for gift boxes – they will give you a surprise jewel! So can you find all gems and complete your collection? Enjoy and have fun in playing Merge Jewels Game. Good luck. This game is one of our puzzle games at Round Games. This game is also tagged as a logic and jewel game. To play even more free games, view our most played and all games pages. If you want to play more games like Merge Jewels Game: Then you can simply check out the games inside the game tags that are the most relevant to your interests or check the puzzle Games category or check the related games section at the end of the game page.